Not even out of BETA, Google+ has caused some irritation to Facebook. You can’t help but seeing reviews on the concept of “Google+ Circles” and your ability to project your information to specific circle of people rather then having it pasted to your entire ‘friend list’ in Facebook. After all, we segment our lives differently then all or nothing. Google+ calls them “People”, Facebook calls them “Friends” I can subscribe to people’s feeds in Google+, and yes even narrow that down by creating a sub-set call Circles. Now in Facebook I can subscribe to ‘someone’ without being a being a friend. Facebook has introduced a new look to ‘Lists’. You could always create friend lists, but most people never used them because they were not the easiest to create or maintain. Now they are more predominant on the screen and they include showing the number of new updates since last time on. I will post more on this later. Finally, I can follow a person without giving them the false hope that we have somehow become anything other then an non-friend acquaintance, if that. My casual hook-up with them is simply a matter of convenience to satisfy my natural curiosity of what they have to offer. Our relationship simply lasts as long as they provide me what I need, and I can drop them as quickly as I met them. No emotional strings attached! How nice of Facebook for finally allow such unfriendly relationships. a person must turn this feather on to allow someone to subscribe to them. you get to decide how much you want to see from your subscriptions, photo’s only, or how about ‘no more game messages!’ – that’s actually a good thing. If you can’t subscribe to someone, just remember “It’s not you, it’s them” and you don’t have to feel left out, no one can then subscribe to that person. 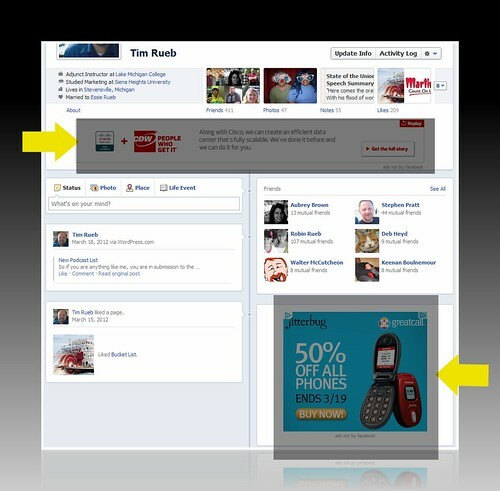 Facebook Pages have gone through a lot of changes expect more changes to come that way as well. Intimacy is expensive, why abuse it? This week the ROI Hunters are amazed at the foolishness of some of the big service providers. They send out information for us to act on but add an extra line in the mailing label that just destroys everything they hope to achieve. After all, hunting ROI requires you to know your prey! Those three little words on the mailing label: “Or Current Resident“. Don’t they understand what damage it does. We pay these companies large amounts of our resource to use their services and we expect them to send us relevant and timely information or special offers because we are valued. What is suppose to be an opportunity to further evolve the relationship with the client becomes just a cheep marketing tactic to sell more stuff. What are you really telling me. The message is clear. The offer enclosed in this envelope is no more personalized or sensitive to our needs, our account information, our interests, then the yellow pages we just looked at to find a new service provider. In fact, the service provider probably thinks so little of us that the material enclose in the envelope is probably more applicable if we weren’t there and some stranger opened it. The ROI Hunters always advise our clients to be specific and focused in your communications. When communicating to your clients, speak only to your clients. When designing a new campaign to attract new clients, don’t send it to your clients. It might just be the excuse they need to dump your company for another. Good Hunting.